The idea of a hereafter is certainly not a new one. Human survival has been contemplated since man had the intelligence to consider his destiny. What is new is the knowledge of the spirit world that was received by the Washington, D.C. lawyer James E. Padgett from inhabitants of all levels of this unseen world. In the simplest terms the spirit world is a place where the human soul continues its existence after physical death, and where it unfolds spiritually towards eventual perfection. The spirit world co-exists with the physical world, though at a higher vibration; in this way, the spirit world can occupy the same space though in a higher dimension. The spirit world is a very busy place each year an astonishing 60 million people worldwide leave the Earth behind and enter the spirit world - that equates to 164,000 people per day. Most people are ill prepared to survive physical death, and their transition to a spiritual world. Family and friends who have gone before must help the new spirit adjust to the unfamiliar surroundings. 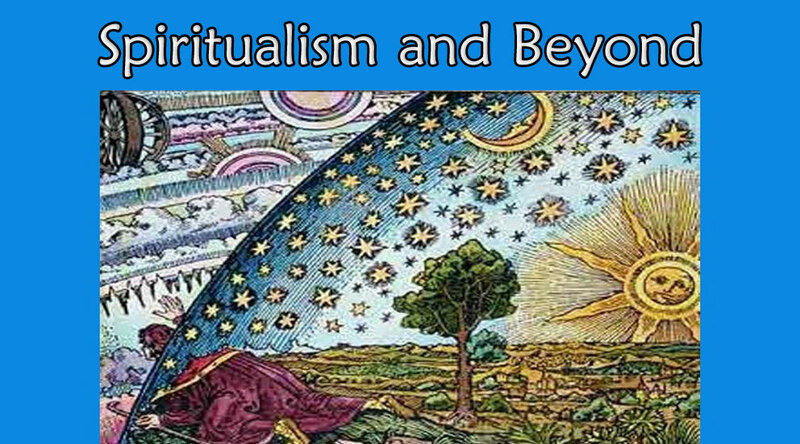 Of course, all of this is based upon the belief that there is a spiritual part of humans (the soul) that is invisible to mortal vision, and is separate and apart from the physical body that continues in the spirit world. There are many ideas about what happens after physical death; however, from the writings of James Padgett, it is a place for the purification and spiritual progress of the soul. There is no such thing as eternal damnation, improvement is open to every soul to eventually become freed from all cares and worries. 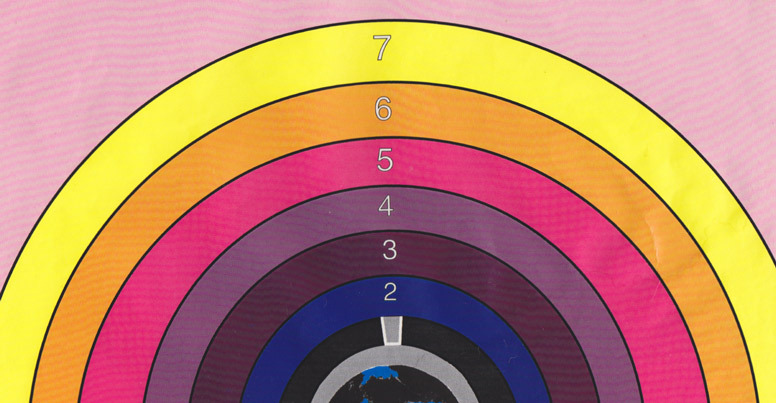 The spirit world is comprised of seven concentric numbered levels or spheres. The idea of spheres in the afterlife is an ancient one and appears in the literature of a number of religions. They are called, 'spheres' because they encompass the Earth, which is a sphere itself - a globe. Each sphere has several planes of habitation within them. These levels have fixed lines of demarcation, which a spirit cannot pass through until its condition, and vibration are comparable to the plane above. When the physical body dies the soul is released and is drawn up to a location in the spirit world by the law of attraction that is harmonious with its vibration. 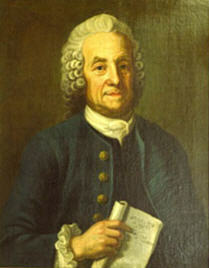 This initial location is not determined by belief of the mind, but by the attainment of the soul during its Earth life. In between the earthplane and the second sphere is a buffer zone (the gray band), this is not a numbered sphere but a neutral space. Spirits do not live in the buffer zone, but use it for their visitations to and from the Earth. The first sphere (the black band) is the closest sphere to the Earth, and contains the least light, and is where spirits inhabit who are paying a penalty for their wrongful thoughts and deeds while on the Earth. Connecting the Earth to the second sphere is a tunnel. There may be many tunnels, which seem reasonable to me, but this I do not know for certain. Regardless, of how many there are, do spirits need a tunnel to get to their homes in the spirit world? Of course not! 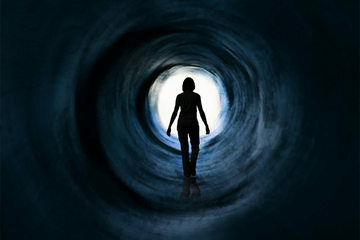 I believe the tunnels are there to insulate NDE experiencers as well as new spirits while on their way to the spirit world from seeing the penalties being paid by those spirits who inhabit the first sphere. "In the spirit world, hell is a place, as well as a condition; and as a place, it has all the accompaniments that make it a reality to the spirits who inhabit it. The condition of the spirits who are in these hells is determined by their recollections worked upon by their consciences. There are, of course, no fires or brimstone lakes or devils with pitchforks adding to the sufferings of these spirits, but yet, there are certain conditions and appearances that are outside of the spirits themselves that cause their recollection to become more acute and to work in a manner to produce a greater degree of suffering". "The memory is man's storehouse of good and evil, and it does not die with the death of the body. On the contrary, it becomes more active and alive, and nothing is left behind or forgotten when man casts off the benumbing and deceiving influences of the mortal flesh." "The great cause that operates to relieve spirits of these memories is love. Love embraces many qualities, such as remorse, sorrow, and the desire to make amends for injuries done. until a spirit's love is awakened none of these feelings will come. He or she cannot possibly feel remorse or regret or the desire to atone until love, no matter how slight, comes into his or her heart. They may not realize just what the cause of these feelings are, but it is love just the same. As these feelings operate a memory here and a memory there will leave never to return and the suffering becomes less. After awhile when they have all gone and he or she becomes free from the law, as though it had become extinct." This is the sphere of familiarity because the surroundings resemble those of the Earth. This is where ordinary people go, who did the best they knew how, but were not intellectual or spiritually minded. This sphere is not identical to the Earth, but for the most part is very similar. The homes, avenues and trees will seem familiar to the new spirit. Family, friends and neighbors will be recognizable and can be easily found. A spirit destined for this sphere has little difficulty adjusting to life there. "The new spirit is met by family and friends who have gone before, with love, kindness and consolation at a lovely greeting place. but, eventually the parting must come and every soul must find its home according to its soul condition. Then comes a time when that soul must stand alone in its weakness or strength and realize that no other can bear its sorrows or take from it its burdens or enter into its suffering." I can envision a spirit welcoming committee of family and friends lined up according to their closeness and love for the new spirit. I would also say that often the welcoming place is a nicer one than the home that the spirit has made for itself by how it lived its life on the Earth. "A surprise for some who have made their transition will be to see the stately buildings, comfortable houses, gardens, cities, pets, all sorts of games, sports, amusements; and the pleasures of science, art, music and literature, and to be able to continue those things that were of interest in the earth life." 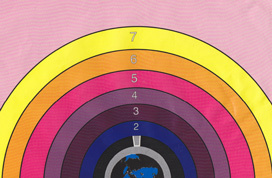 The second sphere is where most of the communications originate that are received by mediums. This is because spirits in this sphere are ordinary people and the mediums of the Earth will have no difficulty matching their vibration, which is necessary for them to make contact. This is the first sphere of habitation for people who are on a devotional path, either while on the Earth or since coming to the spirit world. They have developed a high quality of love to inhabit this sphere, and it is said to be the first heavenly realm of the spirit world. "My home is very beautiful. It is made of something like white marble and is surrounded by lawns and flowers and trees. There are many beautiful pictures on the walls, and the floors are inlaid with beautiful mosaics. I have splendid furniture and my library is full of books. I have music, such as you never heard and instruments of various kinds, which I am learning to play. I sing with all my heart, as the days go by. I have a bed on which I lie, but do not need sleep we only rest, for sometimes we get tired from our work." "We eat fruit and nuts not because we are hungry, but more because we enjoy the flavors. They are like pears, grapes, oranges and pomegranates - of course not just the same, as you know them. We do not actually eat these things with our teeth and palate or use our intestinal organs, as you do, but we imbibe, as it were, the delicious flavors and aromas of the fruits; and, strange as it may seem, we are just as satisfied, and probably more so than when you eat these things with your physical organs." There are three possible ways, or paths of progress through the spheres to higher levels in the spirit world. I. The first path is through the development of the intellect. This is achieved by learning and increasing one's powers of thought and reason. Spirits progressing on this path use spheres two, four and six. II. The second path is that of the purification of the human or natural love. All humans have this love endowed in their souls, though it needs to be purified by expressing good thoughts and deeds. Spirits progressing on this path also use spheres two, four and six only different planes of those spheres. III. The third path is the most spiritual, and is developing a relationship with God by acquiring God's divine love. When this higher love is acquired and implanted in the soul, it replaces the natural love the soul was originally endowed with at its creation. Spirits advancing on this path use the third, fifth, and seventh spheres for their progress. 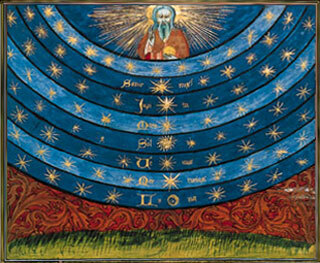 Directly above the seventh sphere is a new realm known as the 'kingdom'. It is not as ancient as the seven spheres, for it is just over two thousand years old, and was created at the time of Jesus's birth. The kingdom is clearly the central theme of the New Testament and is mentioned more than a hundred and fifty times: "Seek ye first the kingdom of God, and his righteousness; and all these things shall be added unto you." 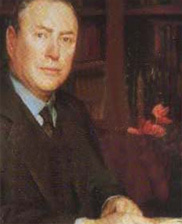 A.G. Riddle (law partner of medium): "The kingdom, as a place, is real and independent of the state of the soul, though it is necessary for the soul to be in a corresponding state in order to enter the kingdom. The many mansions spoken of are there and change not, and whether they shall have occupants depends upon the soul's harmony with the laws of God to enter this kingdom." The kingdom is of great spiritual importance because its purpose is the redemption of all humanity. When the kingdom is completed, the hells of the spirit world will be emptied, and the world will be restored to the paradise that it once was. 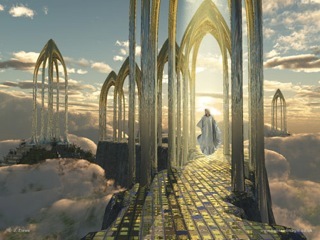 The kingdom is under construction, though, it is not being built with bricks and mortar, but with souls of humans transformed by God's love into divine angels. God knows very will that men will never bring peace and harmony to the world through their own efforts. So, in God's wisdom and goodness, a plan has been devised whereby this will be achieved through the building of this spiritual kingdom high up in the spirit world. When the kingdom is completed, all hatred, envy, bigotry, greed, anger, and selfishness will be removed from the hearts of men, all will be brothers, ending the want and suffering of the world forever.